We are still experiencing very low solar flux values. It seems as thought this bottom is lasting forever. At least it does make for good FMT conditions, on 80 and 160 meters. Thanks to all that participated and special thanks to the new guys that took part in this FMT. K0MZ KS Thanks for the FMT. As I use WWV 10MHz as a reference for my counter, the WWV signal was very weak tonight. After the WC run I noticed that there was another weak signal very near WWV and I may have tuned up my counter to that wrong signal. So, I made some corrections to my measurement for the WC run. I may have also had a problem with the 80 meter K5CM run. For what it is worth, there are the measurements. K1GGI EMA Decent copy, moderate qsb on all sigs. Lots of spread on W6OQI. Thanks Connie and Marvin. K2TV NLI Great Fun! I let my IC-756ProII warm up for five hours. In the CW mode I measured the frequency using the IC-756ProII readout and switching between CW and CW-R until the audio tones matched on the counter when switching between the two while adjusting the frequency on the radio. K6HGF LAX Good 80 meter signal from K5CM. 160 meters pretty weak. Thanks for the FMT. KT6KT NV FT-847. RST: 160M;479, 80M;599, WC-80M;599. Thanks. N5DM STX Resubmission with subtraction of 650Hz CW offset frequency from actual dial frequency of TS-480S while receiving unknown frequency in CW mode. W3JW VA Good signals from both stations tonight. Plenty of doppler on the 80 meter freqs to keep the analysis interesting! TNX fer the FMT! 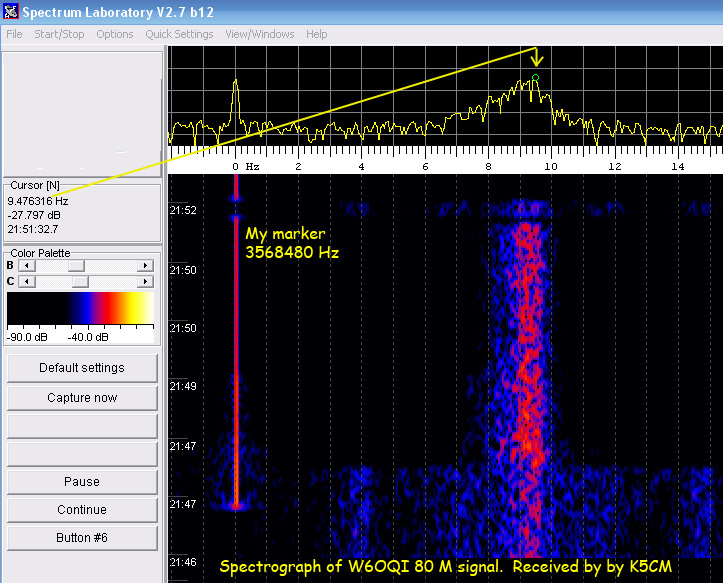 W6OQI LAX K5CM signal was S9 on 80 meters with minimal doppler shift. 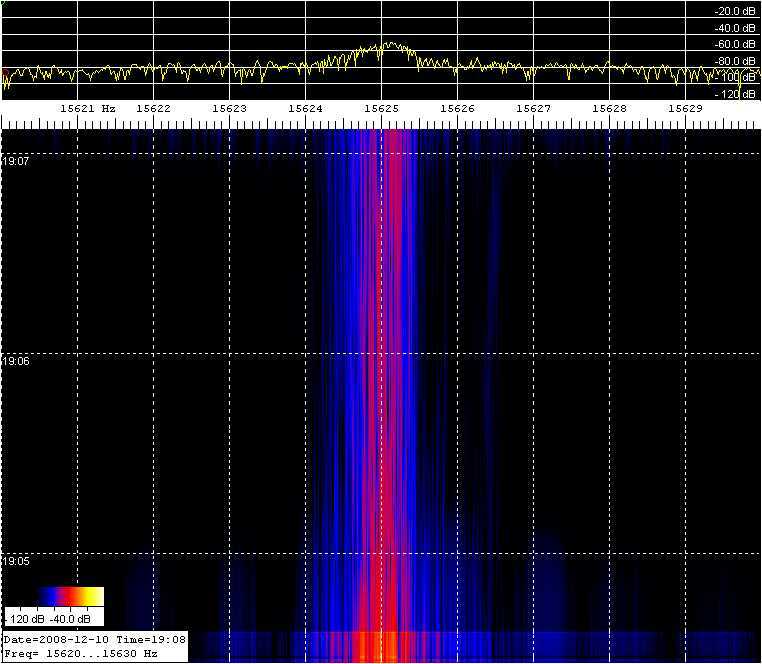 40 meter signal was not as strong, about S5, but with more doppler shift. WA1ABI RI Wild Doppler on all freqs tonight. Thanks Connie and Marvin. WA3BDV EPA I could not hear the 80m west coast transmission. I'm just using a Pro3 and switching between CW/CWR listening for a pitch change, then verifying against CHU at 3330. Lots of fun and a good challenge. Thanks Connie! WA4FJC VA Good signal here in VA this time. wb6zqz EB Warmed up ProIII and Spectrum Lab. Calibrated against WWV and Trimble Thunderbolt at 10mhz. 160m sigs in the noise. Plenty of doppler on all signals, especially eastern. Signal strength varying by 2+ S units. In this classical example above, the saw-toothed shaped waveform is very evident. Sometimes in the early evening the real signal is very near the right rising edge of the saw-tooth. I must say however, I was very lucky to hit the nail on the head with this much Doppler present. Also keep in mind this technique does not always work and a simple average would yield better results. Hear a brief audio snippet of Marvin's 80 Meter signal as copied by K5CM. In the above spectrograph 15625 is 3577085 Hz. Frequencies to the Left are higher. In the above spectrograph, 1500 is 3577086 Hz. Jeff uses LSB so frequencies to the Left are higher. 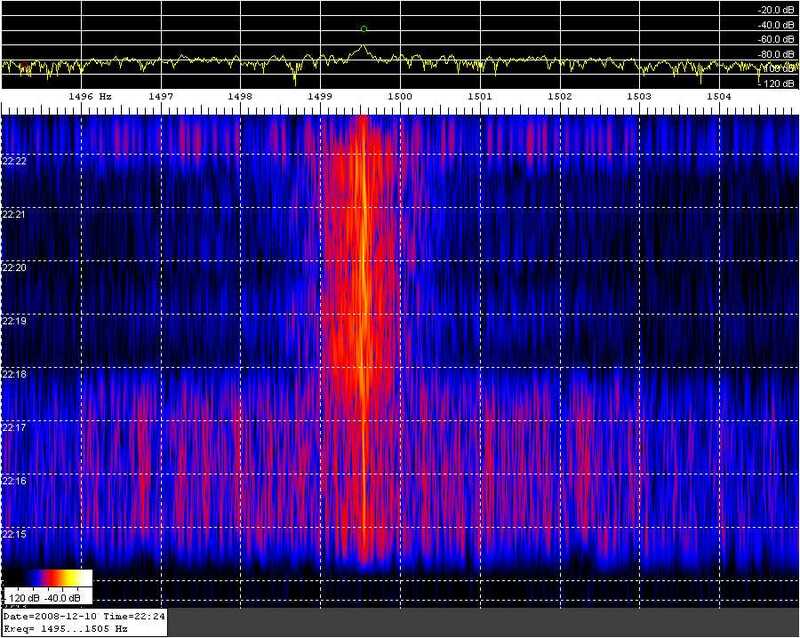 In the above spectrograph, 1500 is 1846081 Hz. Jeff uses LSB so frequencies to the Left are higher. 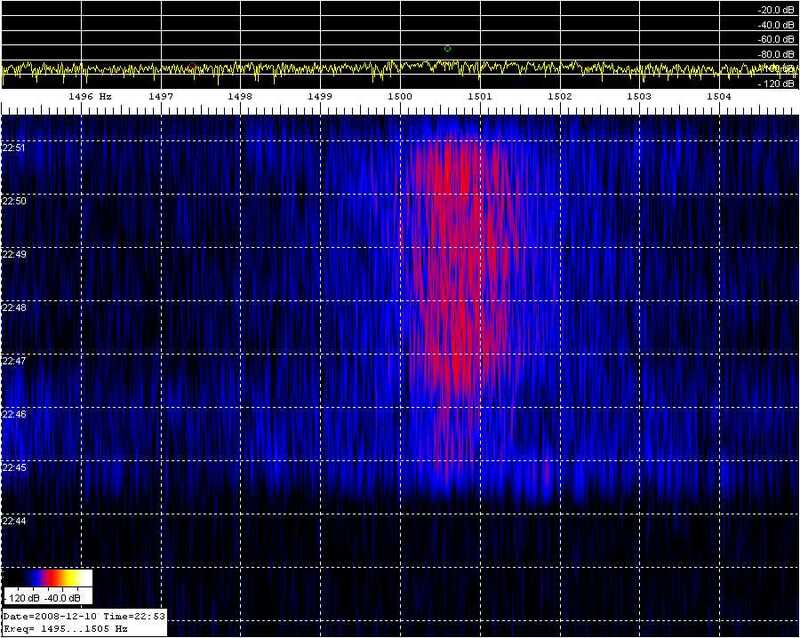 In the above spectrograph, 1500 is 3568490 Hz. Jeff uses LSB so frequencies to the Left are higher. A Trimble Thunderbolt GPS frequency source clocks a HP-3336B. A 10 db transistor amp follows and drives a 12BY7 / pair 6146. Then to the final amplifier, a Dentron 2500 running 400 watts on 160m, 225 watts on 80m. There are no mixers or any device in the chain of amplifiers that might impact the accuracy of the GPS frequency source. As a reality check, I periodically log the frequency source against WWVB. I monitor each transmission with a completely separate receive system to look for any instability or short term drift. The separate system is not locked to the GPS transmitting system.